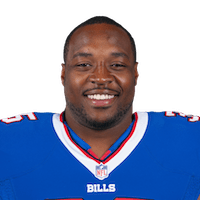 Tolbert indicated this week that he'd like to continue his playing career, Jadon Ceravolo of the Bills' official site reports. "I definitely have. 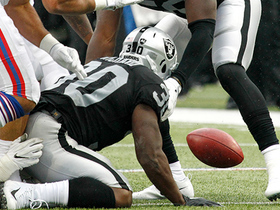 I've got a lot of good football left in me, so we'll see what happens," said the veteran. "Obviously, I was on a one-year deal here and my contract is up." Tolbert's teammate LeSean McCoy (ankle) is active for Sunday's playoff game in Jacksonville. Analysis: Tolbert had one of his better games amid a poor season during the team's big Week 17 win following the in-game injury to McCoy, rushing for 39 yards on just seven carries. With McCoy planning on giving it a full go Sunday and Marcus Murphy in the mix, Tolbert remains an unlikely source for meaningful production. Tolbert carried seven times for 39 yards in Sunday's win over Miami while catching one of two targets for six yards. Tolbert carried the ball three times for minus-three yards and caught one of two targets for 11 yards during Sunday's loss to the Patriots. Bills offensive coordinator Rick Dennison said his decision between Tolbert and Travaris Cadet for the No. 2 running back role could change on a week-to-week basis, Mike Rodak of ESPN.com reports. Analysis: One week after returning from a hamstring injury to take six carries for 32 yards, Tolbert was a surprise healthy scratch for Sunday's 24-16 win over the Dolphins. A Week 16 matchup against the Patriots would also seem to favor Cadet's receiving prowess over Tolbert's size, but the Bills could make another surprising decision or simply keep both players active. Regardless, everything points to another huge workload for LeSean McCoy. Tolbert is a healthy scratch for Sunday's game against the Dolphins, Mike Rodak of ESPN.com reports. Analysis: As a result, Travaris Cadet will handle the Bills' No. 2 running back duties behind LeSean McCoy on Sunday. Tolbert logged six carries for 32 yards in last weekend's 13-7 overtime win over the Colts. Tolbert rushed six times for 32 yards in Sunday's 13-7 overtime win over the Colts. Analysis: The burly tailback made his return after a three-game absence due to a hamstring injury and was effective with his modest number of opportunities. Tolbert remains a decidedly complementary option behind the elite LeSean McCoy, with his only true fantasy value coming from occasional goal-line opportunities. Tolbert (hamstring) practiced fully Thursday. Analysis: While Tolbert looks like a go this week, Travaris Cadet (concussion) was limited Thursday. Either way, LeSean McCoy remains the Bills' undisputed top back, but if Cadet isn't cleared for Sunday's game against the Colts, Tolbert would earn the fantasy dart status that comes with backing up McCoy. Tolbert (hamstring) practiced in a limited fashion Wednesday. Analysis: Tolbert has missed the Bills' past three games, but his potential return to action Sunday against the Colts comes at a good time, with fellow running back Travaris Cadet (concussion) having missed practice Wednesday. While a healthy Tolbert is capable of occasionally making his mark around the goal line, LeSean McCoy remains the team's undisputed top back. Tolbert (hamstring) is expected to return to practice this week, Joe Buscaglia of WKBW.com reports. Analysis: Tolbert's return comes at a good time with fellow backup running back Travaris Cadet entering the concussion protocol. Tolbert missed the past three games, but his impending return to practice should give him a shot to get back on the field for Week 14 against the Colts. Cadet has been more of a threat to LeSean McCoy's receiving workload, whereas Tolbert is more of a threat to poach goal-line carries. Tolbert (hamstring) has been ruled out for Sunday's game against the Patriots, Chris Brown of the Bills' official site reports. Analysis: Tolbert will be sidelined for the third contest in a row, leaving Travaris Cadet to continue backing up LeSean McCoy. Cadet has been effective in a change-of-pace role the last couple of weeks and could retain the No. 2 spot on the depth chart at running back even once Tolbert is healthy again. Tolbert (hamstring) remained sidelined at Thursday's practice, Mike Rodak of ESPN.com reports. Analysis: Tolbert looks iffy, at best, for Sunday's game against the Patriots. If he's unable to suit up for the contest,Travaris Cadet would serve as LeSean McCoy's backup once again, an assignment that would give Cadet modest utility in PPR formats, given that he's combined for nine carries for 45 yards and nine catches for 60 yards over the Bills' last two outings, both of which Tolbert missed. Tolbert (hamstring) won't take part in practice Wednesday, Mike Rodak of ESPN.com reports. Tolbert (hamstring) has been ruled out for Sunday's game against the Chiefs, Joe Buscaglia of 7 ABC Buffalo reports. Analysis: Tolbert practiced on a limited basis Wednesday, but that was the only activity he got in over the last two weeks, so he will sit out for the second time in as many games. With Tolbert out for Week 12, LeSean McCoy should receive the short-yardage work Tolbert generally sees, and Travaris Cadet will assume the backup running back duties for the second straight week. Tolbert (hamstring) didn't practice Thursday. Analysis: Tolbert's role backing up LeSean McCoy has yielded modest fantasy production of late, and if he is forced to miss another game, Travaris Cadet (who caught six passes in Week 11) would be in line to serve as McCoy's backup Sunday afternoon against the Chiefs. Tolbert (hamstring) will practice in a limited fashion Wednesday, Mike Rodak of ESPN.com reports. Analysis: Tolbert wasn't able to practice in any capacity before being ruled out for the Week 11 loss to the Chargers, so his limited involvement in Wednesday's session amounts to a step forward. If Tolbert is healthy enough to play Sunday against the Chiefs, he could unseat Travaris Cadet for primary backup duties behind LeSean McCoy, though Cadet could retain a role on passing downs. Tolbert (hamstring) has been ruled out for Sunday's game against the Chargers. Analysis: Tolbert's lack of availability for the contest isn't a surprise after he failed to practice Wednesday through Friday. His absence leaves Travaris Cadet as the lone healthy running back behind starter LeSean McCoy. Tolbert (hamstring) didn't practice Thursday, Mike Rodak of ESPN.com reports. Analysis: Tolbert has one more chance to hit the practice field this week, but if he is unable to go Sunday against the Chargers, Travaris Cadet would be in line to serve as LeSean McCoy's top backup. Tolbert is dealing with a hamstring injury and didn't practice Wednesday, Chris Brown of the Bills' official site reports. Analysis: Between the injury and the lack of production -- he's averaging just five rushing yards per game over the last three weeks -- Tolbert's value is far beneath what was projected entering the season, when there was some belief he might serve as a goal-line and short-yardage option. 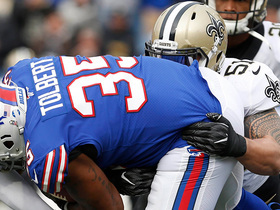 Tolbert carried two times for minus-2 yards during Sunday's blowout loss to the Saints. He also caught both of his targets for 17 yards. Analysis: Tolbert hasn't passed 20 yards from scrimmage in any of the last three games, as the Bills continue to rely almost exclusively on a healthy LeSean McCoy. There was originally some promise that Tolbert might get most of the goal-line work this season, but he's been shut out of the end zone from Week 2 on, both in the running and passing games. 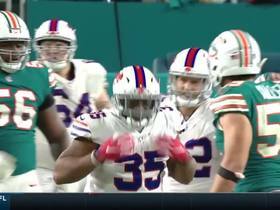 Buffalo Bills fullback Mike Tolbert picks up 10 yards and a first down on a short pass from quarterback Tyrod Taylor. 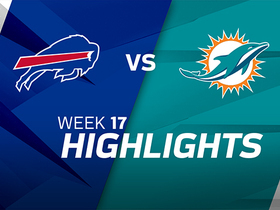 Watch the best plays from the week 17 matchup between the Miami Dolphins and Buffalo Bills. 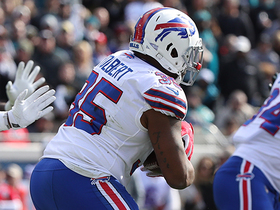 Buffalo Bills fullback Mike Tolbert rushes for 16 yards. 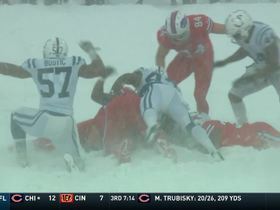 Indianapolis Colts linebacker Barkevious Mingo forces Buffalo Bills fullback Mike Tolbert to fumble and it is recovered by the Colts. New Orleans Saints linebacker Manti Te'o stops Buffalo Bills fullback Mike Tolbert on third down. 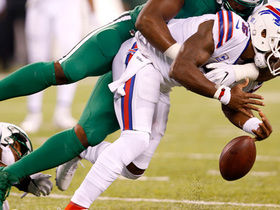 Buffalo Bills quarterback Tyrod Taylor tries extending the play and fumbles, New York Jets linebacker Demario Davis picks it up and almost scores. 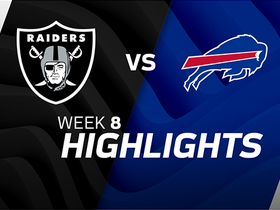 Watch the best plays from the Week 8 match up between the Oakland Raiders and the Buffalo Bills. Buffalo Bills linebacker Matt Milano strips the ball away from Oakland Raiders running back Jalen Richard, and the Buffalo Bills recover. 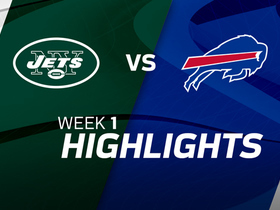 Watch the best plays from the New York Jets and Buffalo Bills Week 1 match up. 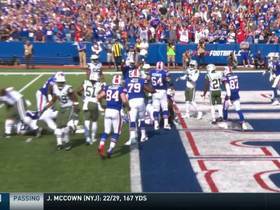 Buffalo Bills running back Mike Tolbert rushes up the middle for a 1-yard touchdown.